Associate Professor in the Department of Family Medicine and the Department of Epidemiology and Community Medicine at the Bruyère Research Institute at the University of Ottawa in Ontario. Associate Professor in the Department of Psychiatry at the University of Toronto in Ontario and Clinician Scientist and staff psychiatrist in the Geriatric Psychiatry Division at the Centre for Addiction and Mental Health in Toronto. Clinician Investigator in the Department of Family Medicine at the University of Ottawa and Clinical Scientist at the C.T. Lamont Centre for Primary Health Care Research of the Bruyère Research Institute. Professor in the Faculty of Pharmacy and Pharmaceutical Sciences at the University of Alberta in Edmonton. Director of the Division of Clinical Pharmacology and Professor in the Department of Medicine at McMaster University in Hamilton, Ont, and Senior Scientist at the Centre for Evaluation of Medicines of St Joseph’s Healthcare Hamilton. Professor in the Department of Medicine in the Division of Geriatric Medicine and Gerontology at the Johns Hopkins University School of Medicine in Baltimore, MD. Psychiatrist at the Ottawa Hospital and Full Professor in the Department of Psychiatry at the University of Ottawa. Pharmacy resident at the Ottawa Hospital. Assistant Professor in the Department of Family Medicine at the University of Ottawa, Adjunct Assistant Professor in the School of Pharmacy at the University of Waterloo in Ontario, and Scientist at the Bruyère Research Institute. Objective To develop an evidence-based guideline to help clinicians make decisions about when and how to safely taper and stop benzodiazepine receptor agonists (BZRAs); to focus on the highest level of evidence available and seek input from primary care professionals in the guideline development, review, and endorsement processes. Methods The overall team comprised 8 clinicians (1 family physician, 2 psychiatrists, 1 clinical psychologist, 1 clinical pharmacologist, 2 clinical pharmacists, and 1 geriatrician) and a methodologist; members disclosed conflicts of interest. For guideline development, a systematic process was used, including the GRADE (Grading of Recommendations Assessment, Development and Evaluation) approach. Evidence was generated by conducting a systematic review of BZRA deprescribing trials for insomnia, as well as performing a review of reviews of the harms of continued BZRA use and narrative syntheses of patient preferences and resource implications. This evidence and GRADE quality of evidence ratings were used to generate recommendations. The team refined guideline content and recommendations through consensus and synthesized clinical considerations to address front-line clinician questions. The draft guideline was reviewed by clinicians and stakeholders. Recommendations We recommend that deprescribing (tapering slowly) of BZRAs be offered to elderly adults (≥ 65 years) who take BZRAs, regardless of duration of use, and suggest that deprescribing (tapering slowly) be offered to adults aged 18 to 64 who have used BZRAs for more than 4 weeks. These recommendations apply to patients who use BZRAs to treat insomnia on its own (primary insomnia) or comorbid insomnia where potential underlying comorbidities are effectively managed. This guideline does not apply to those with other sleep disorders or untreated anxiety, depression, or other physical or mental health conditions that might be causing or aggravating insomnia. Conclusion Benzodiazepine receptor agonists are associated with harms, and therapeutic effects might be short term. Tapering BZRAs improves cessation rates compared with usual care without serious harms. Patients might be more amenable to deprescribing conversations if they understand the rationale (potential for harm), are involved in developing the tapering plan, and are offered behavioural advice. This guideline provides recommendations for making decisions about when and how to reduce and stop BZRAs. Recommendations are meant to assist with, not dictate, decision making in conjunction with patients. Long-term use of benzodiazepine receptor agonists (BZRAs), including benzodiazepines, zopiclone, and zolpidem, for insomnia is common in adults and the elderly in both community primary care and institutional practice.1,2 The benefits of BZRAs for insomnia can be briefly summarized by referring to the meta-analysis by Holbrook et al, which found short-term (1 day to 6 weeks) improvements in sleep onset latency of 4 minutes and an additional hour of sleep duration.3 However, chronic use of BZRAs might lead to physical and psychological dependence. In 2012, more than 30% of Canadian seniors in long-term care facilities and more than 15% living in the community used BZRAs.4 New evidence has emerged suggesting that the efficacy of BZRAs for insomnia can diminish in 4 weeks, but adverse effects might persist.5 Benzodiazepine receptor agonists were selected in a Canadian consensus process among family physicians, pharmacists, nurses, and geriatricians as the most important medication class for developing a deprescribing guideline.6 In an effort to provide evidence-based recommendations and tools to aid clinicians in reducing or stopping medications that might no longer be needed or that might be causing harm, we initiated the Deprescribing Guidelines in the Elderly project (www.open-pharmacy-research.ca/research-projects/emerging-services/deprescribing-guidelines). Our objective was to systematically review the benefits and harms of deprescribing BZRAs, and use patient values and preferences and cost literature to develop evidence-based guidelines that assist clinicians and patients in making decisions about and taking action on reducing BZRA use. Benzodiazepine receptor agonists attach to a site on the γ-aminobutyric acid type A receptor, but when they are used over an extended period of time, the receptor can physically change, leaving less potential for sedation but persistent amnestic effects.17 Studies detect loss of therapeutic effect in a matter of 7 to 28 days.5 Unfortunately, many patients are unaware of this effect and continue taking these agents indefinitely. This is problematic considering the potential for adverse effects (eg, falls, fractures, cognitive problems), especially in older persons.18,19 For this reason, reviews have emerged over the past number of years investigating the effectiveness of interventions to stop or reduce use of BZRAs, but none has focused specifically on patients using BZRAs for insomnia.20–23 While useful, these systematic reviews do not provide practical approaches to stopping or reducing BZRAs. Further, despite the scope of BZRA use, there are currently no evidence-based guidelines to assist clinicians in stopping or reducing use of BZRAs. Deprescribing is the planned and supervised process of dose reduction or stopping of medication that might be causing harm or no longer providing benefit. The goal of deprescribing is to reduce medication burden and harm, while maintaining or improving quality of life. Our deprescribing guidelines, from our Deprescribing Guidelines in the Elderly project, use evidence to prioritize medications for deprescribing, to determine benefit and harms of continuing versus deprescribing a medication, and to suggest methods for approaching and implementing deprescribing plans with patients. We used the GRADE system for guideline development (Box 1).27 The GDT formulated the main clinical management question as follows using the PICO (population, intervention, comparison, outcome) approach: What are the effects (harms and benefits) of deprescribing BZRAs compared with continued use in adults with insomnia? We also investigated comparative effects of different deprescribing interventions. The GDT articulated definitions of deprescribing that included abrupt discontinuation, tapering, and switching or substituting therapy, among others (Box 2). BZRA—benzodiazepine receptor agonist, GRADE—Grading of Recommendations Assessment, Development and Evaluation. BZRA—benzodiazepine receptor agonist, CBT—cognitive-behavioural therapy. We formulated clinical recommendations from the evidence tables using confidence in estimated effects and taking into account benefits and harms of BZRA deprescribing, patient preferences and values, harms associated with continued BZRA use, and resource implications. The GDT members met via teleconference to review clinical recommendations and voting was conducted by e-mail. All votes were sent to the project coordinator; unanimous agreement was sought; 80% agreement among the 9 GDT members was considered the cutoff for consensus. All GDT members agreed with the final recommendations. The recommendations (Box 3) apply to adults aged 18 and older including elderly adults living in the community or in long-term care facilities who take BZRAs for the purpose of treating primary insomnia or comorbid insomnia where all potential underlying comorbidities are effectively managed. These recommendations do not apply to those with other sleep disorders or untreated anxiety, depression, or physical and mental conditions that might be causing or aggravating insomnia. The rationale for the recommendations is outlined in Table 1.28,29 The algorithm developed for this guideline is provided in Figure 1. Evidence to recommendations table: What are the effects of deprescribing BZRAs compared with continuous use in insomnia for adults ≥ 18 y who use BZRAs for insomnia on its own or for comorbid insomnia with underlying comorbidities managed (specifically, adults 18–64 y using BZRAs for most nights of the week for > 4 wk, or adults ≥ 65 y taking BZRAs for any duration as first-line therapy)? Our systematic review results suggest that slow tapering of BZRAs improves cessation rates at 3 and 12 months (compared with continuation or usual care) and does not result in differences in withdrawal symptom scores. Table 228,30–38 provides examples of tapering. Adding CBT to the tapering intervention improves cessation rates versus tapering alone, but this improvement is not maintained in the long term. Combining CBT and tapering does not appear to ameliorate withdrawal symptoms or affect sleep outcomes more so than tapering alone. Tapering of BZRAs might result in more problems sleeping compared with continuation, but there was no difference between these groups at 12 months. Using melatonin does not appear to improve cessation rates; studies employing zopiclone as a means of tapering from benzodiazepines did not produce usable data to inform recommendations. Based on the lack of evidence of substantial harm of deprescribing, the evidence of potential harm associated with continuing a BZRA (particularly in the elderly), along with resultant resource implications and the feasibility of tapering interventions, we rated the recommendation to deprescribe BZRAs in older patients as strong. The recommendation to deprescribe a BZRA in the younger population was rated as weak owing to lower risk of adverse effects associated with continuing BZRA use. Community and institutional long-term care clinicians at our implementation sites clearly expressed 2 key concerns when applying this deprescribing guideline. First, approaching the patient and getting “buy-in” about reducing BZRA use is challenging. Second, clinicians wanted to know what other approaches could be used instead for insomnia. This section discusses clinically relevant findings on engaging patients, attitudes toward medications, other comorbid conditions, and tapering schedules. What patient attitudes should a clinician expect? When insomnia is caused by a comorbid condition, treatment should first be aimed at optimizing treatment of that condition.12,24 Insomnia might occur on its own, might be related to a psychiatric illness (eg, an anxiety disorder or major depressive disorder), or might be related to another sleep-wake disorder (eg, sleep apnea or restless legs syndrome).40–44 Other comorbid medical conditions such as respiratory diseases or pain disorders45 might also initiate or exacerbate insomnia (such as nocturia, nocturnal pruritus).46–50 Insomnia might be related to substance use (eg, caffeine, alcohol) or pharmacologic treatment of other conditions (eg, antidepressants for major depressive disorder).42 Contributory comorbid mental health conditions need to be considered as part of a comprehensive diagnostic evaluation before initiating treatment or considering deprescribing.50 Once the reason for insomnia has been clearly determined, appropriate treatment can be instituted and the potential for deprescribing BZRAs considered more clearly. How do I engage patients in deprescribing BZRAs? What withdrawal symptoms can be expected and how should they be dealt with? Concern over potential for withdrawal symptoms is a key reason why prescribers often do not approach patients about deprescribing BZRAs. Our systematic review found that there was no difference in overall BZRA withdrawal symptom scores for tapering compared with usual care or continuation of BZRAs. The tapering group reported more trouble sleeping at 3 months compared with continuation of BZRAs (mean difference of 16.1 higher on a 100-point scale of “trouble sleeping,” 95% CI 15.0 to 17.2), but any difference in reports of trouble sleeping was no longer present at 12 months. In many cases, when withdrawal symptoms occur they are mild and short term (lasting a few days and up to approximately 4 weeks).39 In studies detailing benzodiazepine withdrawal symptoms, such symptoms tend to appear and peak more quickly (1 to 2 days) and be more severe with abruptly stopping short-acting benzodiazepines compared with after tapering long-acting benzodiazepines (4 to 10 days).64,65 Gradual taper of short-acting agents does not eliminate withdrawal symptoms but ameliorates their severity, with symptoms beginning to appear once doses are reduced to about 25% of baseline.55 While common, resulting insomnia is typically mild, and patients should be assured that there is no difference in insomnia compared with usual care or continuation of BZRAs at 12 months. Behavioural management education for insomnia (Figure 1 and patient pamphlet at CFPlus)* should be offered to patients to address insomnia during tapering. Other common withdrawal symptoms reported in the literature include irritability, sweating, gastrointestinal symptoms, and anxiety.39 Patients should be reassured that if these symptoms occur they are typically mild and short term (lasting days to weeks), and that discomfort is usually temporary.39 Severe withdrawal symptoms (eg, seizures) do not appear to occur with tapering but have been reported rarely in patients stopping very high doses without tapering39 or who have underlying seizure disorders. Patients should be aware of the potential for withdrawal effects and these can be monitored throughout the tapering process (see monitoring section below for more detail). What nondrug approaches can be used to help with insomnia? A variety of behaviour management strategies and interventions such as CBT have been used to help with insomnia and can be considered as nondrug alternatives should insomnia recur during or after deprescribing of BZRAs.66 Cognitive-behavioural therapy for treatment of insomnia has been widely studied and demonstrates long-term improvements in sleep outcomes.67–70 Our systematic review found that, when used as part of a deprescribing intervention, CBT combined with tapering improved post-intervention BZRA cessation rates compared with tapering alone. This is consistent with the current evidence base.21 However, the improved BZRA cessation rates following deprescribing were not sustained at 3 months and CBT did not improve clinical outcomes. Deprescribing studies typically employed 4 to 6 CBT sessions delivered by clinical psychologists every 1 to 2 weeks. Behavioural interventions and CBT for insomnia are reviewed in more detail elsewhere.67,68 While CBT might be difficult to access for many patients owing to cost and availability, online and self-help options are available.69,71 Brief interventions and Internet-based CBT have also been shown to be effective in improving sleep outcomes.67–69,72 The website sleepwellns.ca is an example of such an online resource; a link to this site is highlighted in our decision-support algorithm (Figure 1) and patient information pamphlet (CFPlus),* in which we offer behaviour management advice. With training, various health care professionals can also provide CBT or its components. What monitoring needs to be done, how often, and by whom? Tapering will reduce, but might not eliminate, withdrawal symptoms.28,34 A monitoring plan should be developed in conjunction with the patient. At each step in the taper (approximately every 1 to 2 weeks for the duration) monitor for severity and frequency of adverse drug withdrawal symptoms (anxiety, irritability, sweating, gastrointestinal symptoms, insomnia), potential benefits (eg, less daytime sedation, improved cognition, fewer falls), and mood, sleep quality, and changes in sleep. This can be done at a scheduled appointment or through a telephone call (by physician, psychologist, pharmacist, or nurse). If desired, withdrawal symptoms can be monitored using the types of scales used in clinical trials (eg, benzodiazepine withdrawal symptom questionnaire or Clinical Institute Withdrawal Assessment for Benzodiazepines scale)73 or via clinical assessment. If withdrawal symptoms occur at a severity and frequency that is bothersome for a patient, consider maintaining the current BZRA dose for 1 to 2 weeks before attempting the next dose reduction; then continue to taper at a slower rate. What if insomnia returns or persists? Where depression or anxiety is present, it might be necessary to initiate pharmacologic- or psychotherapy-based treatment. In the context of insomnia, treatment guidelines13,78 recommend antidepressants that can provide sedation directly. Where patients exhibit features of an anxiety disorder, a first step would be clinical inquiry for anxiety disorders. In the case of generalized anxiety disorder, a condition dominated by worry in which sleep disturbance is an accessory diagnostic feature, psychological therapy (eg, CBT) or pharmacologic treatment are effective options. First-line medications include serotonin or serotonin-norepinephrine reuptake inhibitors and pregabalin.79–81 There is still a need for high-quality direct evidence for adjunctive medications in benzodiazepine deprescribing for insomnia. External clinical review of the guideline was conducted by a practising geriatrician and a pharmacist using the AGREE II (Appraisal of Guidelines for Research and Evaluation) Global Rating Scale tool.85 Relevant stakeholder organizations were invited to similarly review and endorse the guideline. Modifications were made to address reviewer comments. This guideline has been endorsed by the College of Family Physicians of Canada and the Canadian Pharmacists Association. 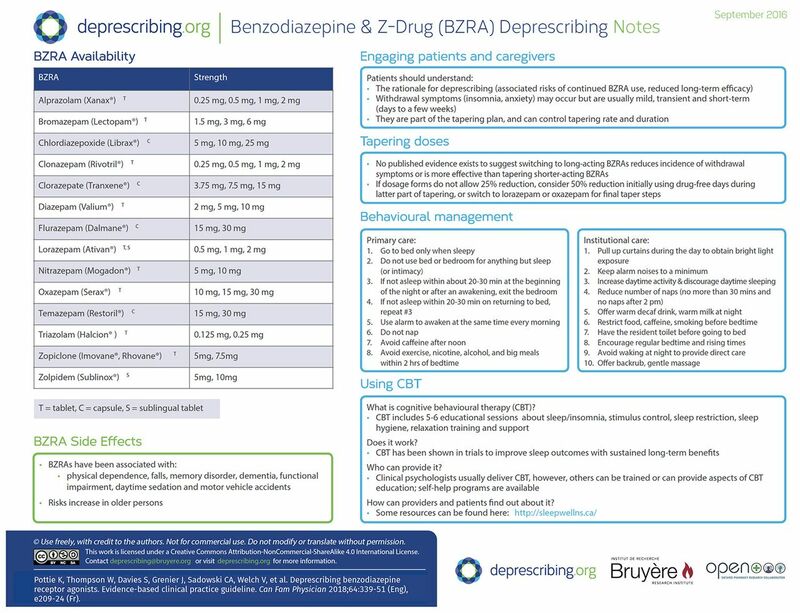 A BZRA deprescribing guideline works in conjunction with current treatment guidelines because it offers clinicians evidence-based recommendations and clinical considerations to help them deprescribe BZRAs. Insomnia is a common and often complex condition. Practitioners need tools to assist them in both diagnosis and treatment of insomnia, recognizing anxiety and other psychiatric conditions, as well as specific forms of insomnia. Our research provides an estimated strategy for tapering BZRAs. We did not identify studies that compared various tapering regimens head-to-head. There is also limited evidence for optimal shared decision-making approaches related to deprescribing BZRAs. Finally, most studies did not evaluate patient-important outcomes such as quality of life or function. Thus, studies comparing patient engagement approaches and tapering strategies (eg, duration of tapering), and focusing on patient-important outcomes (eg, quality of life and function) are needed to help guide effective deprescribing approaches. There is also a need to study BZRA deprescribing in relation to the potential dependence period at around 4 weeks of BZRA use, as well as the cost-effectiveness of BZRA deprescribing interventions. More implementation work is needed to improve the process of tapering, as well as consideration of linking it to multifactorial interventions for improving health in elderly adults. The GDT will provide routine guideline updates as new evidence emerges that might change the recommendations. Prospective evaluation of the effects of this and other deprescribing guidelines will be part of a research strategy in the future. The use of BZRAs for insomnia disorder in aging adults has been associated with falls, dementia, motor vehicle accidents, and physical addiction. This guideline outlines these harms and, through a systematic review, demonstrates the efficacy of deprescribing using tapering regimens in patients who were willing to enter deprescribing trials. Many patients are willing to stop taking BZRAs when they can expect improvements in cognition and reductions in other side effects. The tools provided with this guideline—a decision-support algorithm and a corresponding patient information pamphlet—are intended to support clinicians in engaging with patients about this important topic and implementing deprescribing plans with them. 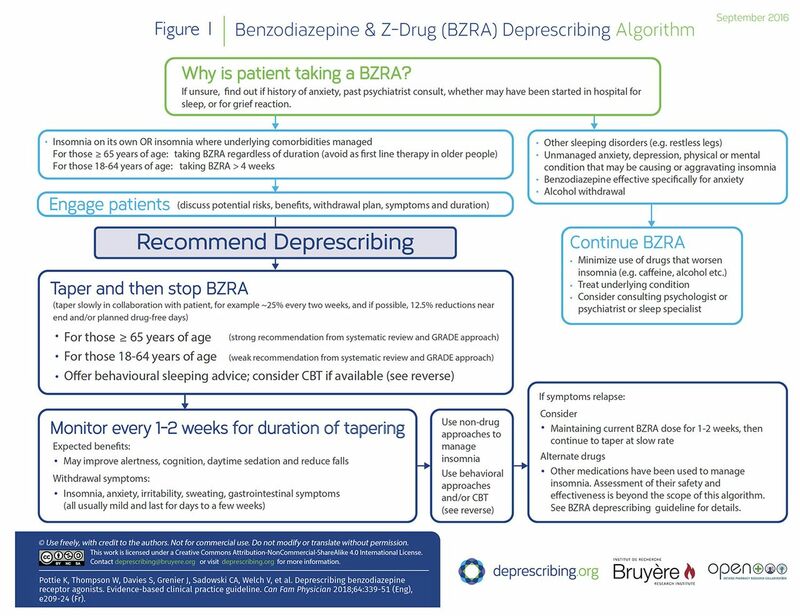 A credible guideline developed with a rigorous evidence-based approach arms the clinician with a clear case for discussions about BZRA deprescribing with patients. We thank members of the Cochrane research team, Elli Polemiti, Sonia Hussain, and Olanrewaju Medu, who conducted the systematic review upon which these recommendations were based. We also thank the staff at the Bruyère Research Institute in Ottawa, Ont, librarian Lynn Dunikowski, and the stakeholders and peer reviewers (Dr Cara Tannenbaum and Lawrence Jackson), whose thoughtful comments helped to improve the quality of this manuscript. Funding for this guideline was provided by the Government of Ontario. ▸ Benzodiazepine receptor agonist (BZRA) prescribing for insomnia is common in both community and long-term care. ▸ The efficacy of BZRAs for insomnia can be diminished in as little as 4 weeks. ▸ Use of BZRAs is associated with increased risk of falls, motor vehicle accidents, memory problems, and daytime sedation—risks that might be increased in the elderly. Choosing Wisely Canada recommends that BZRAs should be avoided as first-line treatment of insomnia in older persons. ▸ A systematic review of BZRA deprescribing in patients demonstrated successful outcomes. The most common withdrawal symptoms were mild, short-term (days to weeks) insomnia, anxiety, and restlessness. There was no evidence of severe withdrawal (eg, seizures) symptoms. ▸ This guideline recommends that deprescribing of BZRAs (by tapering) be offered to all adults who take BZRAs, especially those aged 65 and older. Discuss with your patients and their caregivers the harms of continued use, decreased efficacy over time, tapering options, recommendations for monitoring, and potential withdrawal symptoms. ↵* Descriptions of contributors’ expertise, roles, and conflicts of interest; methods and results of the systematic review and related references; GRADE evidence tables; ranges of frequency ratios for harms; evidence reviews and related references; a patient information pamphlet on deprescribing of benzodiazepine receptor agonists; and an easy-to-print version of the algorithm are available at www.cfp.ca. Go to the full text of the article online and click on the CFPlus tab. Dr Farrell received research funding to develop this guideline; received financial payments from the Institute for Healthcare Improvement and The Commonwealth Fund for a deprescribing guidelines summary; and from the Ontario Long Term Care Physicians Association, the Ontario Pharmacists Association, and the Canadian Society of Hospital Pharmacists for speaking engagements. Dr Boyd received funding from Patient-Centered Outcomes Research Institute for a project related to improving patient-centred care for people with multiple chronic conditions and funding from the National Institutes of Health for a project related to medication regimen complexity in home health care. Dr Sadowski is the primary investigator on an unrestricted grant from Pfizer Canada related to finding novel strategy to address the underdiagnosis and undertreatment of overactive bladder and urinary tract symptoms and is a member of the Alberta Expert Committee on Drug Evaluation and Therapeutics. None of the other authors has any competing interests to declare. La traduction en français de cet article se trouve à www.cfp.ca dans la table des matières du numéro de mai 2018 à la page e209.
. Prioritizing and stopping prescription medicines. CMAJ 2006;174(8):1083-4. Drug use among seniors on public drug programs in Canada, 2012. Ottawa, ON: Canadian Institute for Health Information; 2014. Available from: https://secure.cihi.ca/free_products/Drug_Use_in_Seniors_on_Public_Drug_Programs_2012_EN_web.pdf. Accessed 2018 Mar 20.
. Mechanisms underlying tolerance after long-term benzodiazepine use: a future for subtype-selective GABA receptor modulators? Adv Pharmacol Sci 2012;2012:416864.
. Diagnostic and statistical manual of mental disorders. 5th ed. Arlington, VA: American Psychiatric Publishing; 2013.
. International classification of sleep disorders. Diagnostic and coding manual. Darien, IL: American Academy of Sleep Medicine; 2001.
. Cross-cultural and comparative epidemiology of insomnia: the diagnostic and statistical manual (DSM), international classification of diseases (ICD) and international classification of sleep disorders (ICSD). Sleep Med 2015;16(4):477-82. Epub 2015 Jan 21.
. Prevalence of insomnia and its treatment in Canada. Can J Psychiatry 2011;56(9):540-8. National Institutes of Health State-of-the-Science Conference statement on manifestations and management of chronic insomnia in adults, June 13–15, 2005. Sleep 2005;28(9):1049-57. Canadian Academy of Child and Adolescent Psychiatry, Canadian Academy of Geriatric Psychiatry, Canadian Psychiatric Association. Thirteen things physicians and patients should question. Toronto, ON: Choosing Wisely Canada; 2017. Available from: www.choosingwiselycanada.org/recommendations/psychiatry/. Accessed 2018 Mar 21. Geriatrics: five things physicians and patients should question. Toronto, ON: Choosing Wisely Canada; 2017. Available from: https://choosingwiselycanada.org/geriatrics/. Accessed 2018 Mar 21. American Geriatrics Society 2015 Beers Criteria Update Expert Panel. American Geriatrics Society 2015 updated Beers criteria for potentially inappropriate medication use in older adults. J Am Geriatr Soc 2015;63(11):2227-46. Epub 2015 Oct 8.
. Time course for development of benzodiazepine tolerance and physical dependence. Neurosci Biobehav Rev 1985;9(1):123-31.
. Adverse effects of benzodiazepine use in elderly people: a meta-analysis. Asian J Gerontol Geriatr 2012;7(2):107-11.
. Sedative hypnotics in older people with insomnia: meta-analysis of risks and benefits. BMJ 2005;331(7526):1169. Epub 2005 Nov 11.
. Effectiveness of current treatment approaches for benzodiazepine discontinuation: a meta-analysis. Addiction 2009;104(1):13-24. Epub 2008 Oct 31.
. Interventions for reducing benzodiazepine use in older people: meta-analysis of randomised controlled trials. Br J Psychiatry 2014;204(2):98-107.
. Strategies for discontinuing long-term benzodiazepine use: meta-analysis. Br J Psychiatry 2006;189:213-20.
. Deprescribing benzodiazepines and Z-drugs in community-dwelling adults: a scoping review. BMC Pharmacol Toxicol 2015;16(1):19.
. Treatment options for insomnia. Am Fam Physician 2007;76(4):517-26.
. Older adults and withdrawal from benzodiazepine hypnotics in general practice: effects on cognitive function, sleep, mood and quality of life. Psychol Med 2003;33(7):1223-37.
. The Canadian Rx atlas. 3rd ed. Vancouver, BC: University of British Columbia, Centre for Health Services and Policy Research; 2013.
. Hypnotic taper with or without self-help treatment of insomnia: a randomized clinical trial. J Consult Clin Psychol 2007;75(2):325-35.
. Facilitation of benzodiazepine discontinuation by melatonin: a new clinical approach. Arch Intern Med 1999;159(20):2456-60.
. Gradual withdrawal from benzodiazepines in residents of homes for the elderly: experience and suggestions for future research. Eur J Clin Pharmacol 1997;51(5):355-8.
. Randomized clinical trial of supervised tapering and cognitive behavior therapy to facilitate benzodiazepine discontinuation in older adults with chronic insomnia. Am J Psychiatry 2004;161(2):332-42.
. The effects of substituting zopiclone in withdrawal from chronic use of benzodiazepine hypnotics. Psychopharmacology (Berl) 1998;140(4):450-7.
. Withdrawal from benzodiazepines by initially switching to zopiclone. Eur Psychiatry 1995;10(Suppl 3):145s-51s.
. Is melatonin helpful in stopping the long-term use of hypnotics? A discontinuation trial. Pharm World Sci 2007;29(6):641-6.
. Tapering off long-term benzodiazepine use with or without group cognitive−behavioural therapy: three-condition, randomised controlled trial. Br J Psychiatry 2003;182:498-504.
. Risk versus risk: a review of benzodiazepine reduction in older adults. Expert Opin Drug Saf 2014;13(7):919-34. Epub 2014 Jun 6.
. Prevalence of insomnia in various psychiatric diagnostic categories. Psychiatry Clin Neurosci 2002;56(3):239-40.
. Sleep disorders. In: Hales RE, Yudofsky SC, editors. Textbook of clinical psychiatry. Washington, DC: American Psychiatric Publishing; 2003. p. 975-1000.
. Sleep in psychiatric disorders. In: Chokroverty S, editor. Sleep disorders medicine: basic sciences, technical considerations, and clinical aspects. 3rd ed. New York, NY: Saunders; 2009.
. Insomnia in young men and subsequent depression. The Johns Hopkins Precursors Study. Am J Epidemiol 1997;146(2):105-14.
. Sleep disturbances and psychiatric disorders associated with posttraumatic stress disorder in the general population. Compr Psychiatry 2000;41(6):469-78.
. Insomnia as a risk factor for disease. In: Sateia MJ, Buysse DJ, editors. Insomnia: diagnosis and treatment. London, UK: Informa Healthcare; 2010. p. 31-41.
. Clinical companion to sleep disorders medicine. 2nd ed. Boston MA: Butterworth-Heinemann; 2000.
. Effects of sleep fragmentation on glucose metabolism in normal subjects. Chest 2010;137(1):95-101. Epub 2009 Jun 19.
. Sleep disturbances in dialysis patients. J Nephrol 2008;21(Suppl 13):S66-70.
. Sleep disorders occur very early in chronic kidney disease. J Nephrol 2008;21(Suppl 13):S59-65.
. A decision tree approach to the differential diagnosis of insomnia. In: Billard M, editor. Sleep: physiology, investigations and medicine. New York, NY: Springer; 2003. p. 191-9.
. Too much medicine in older people? Deprescribing through shared decision making. BMJ 2016;353:i2893.
. Comparative efficacy of two interventions to discontinue long-term benzodiazepine use: cluster randomised controlled trial in primary care. Br J Psychiatry 2014;204(6):471-9. Epub 2014 Feb 13.
. Long-term therapeutic use of benzodiazepines. II. Effects of gradual taper. Arch Gen Psychiatry 1990;47(10):908-15.
. Pharmacological interventions for benzodiazepine mono-dependence management in outpatient settings. Cochrane Database Syst Rev 2013;(6):CD005194.
. Predictors of discontinuation of benzodiazepine prescription after sending a letter to long-term benzodiazepine users in family practice. Fam Pract 2006;23(1):65-72. Epub 2005 Aug 17.
. The effect of minimal interventions by general practitioners on long-term benzodiazepine use. J R Coll Gen Pract 1989;39(327):408-11.
. Long-term outcome after discontinuation of benzodiazepines for insomnia: a survival analysis of relapse. Behav Res Ther 2005;43(1):1-14.
. Cognitive-behavioural, pharmacological and psychosocial predictors of outcome during tapered discontinuation of benzodiazepine. Clin Psychol Psychother 2008;15(1):1-14.
. Predictors of long-term benzodiazepine abstinence in participants of a randomized controlled benzodiazepine withdrawal program. Can J Psychiatry 2006;51(7):445-52.
. Tolerance and rebound insomnia with rapidly eliminated hypnotics: a meta-analysis of sleep laboratory studies. Int Clin Psychopharmacol 1999;14(5):287-303.
. Requirement of α5-GABA receptors for the development of tolerance to the sedative action of diazepam in mice. J Neurosci 2004;24(30):6785-90.
. Withdrawal reaction after long-term therapeutic use of benzodiazepines. N Engl J Med 1986;315(14):854-9.
. Long-term therapeutic use of benzodiazepines. I. Effects of abrupt discontinuation. Arch Gen Psychiatry 1990;47(10):899-907.
. Management of chronic insomnia disorder in adults: a clinical practice guideline from the American College of Physicians. Ann Intern Med 2016;165(2):125-33. Epub 2016 May 3.
. Effective Health Care Program: management of insomnia disorder. Rockville, MD: Agency for Healthcare Research and Quality; 2015. Available from: https://effectivehealthcare.ahrq.gov/sites/default/files/related_files/insomnia_executive.pdf. Accessed 2018 Mar 22.
. Internet-delivered cognitive behavioral therapy to treat insomnia: a systematic review and meta-analysis. PLoS One 2016;11(2):e0149139.
. Cognitive behavioral therapy for chronic insomnia: a systematic review and meta-analysis. Ann Intern Med 2015;163(3):191-204. Get your sleep back. Sleepwell Nova Scotia [website];. 2018. Available from: http://sleepwellns.ca/get-your-sleep-back. Accessed 2018 Mar 22.
. Efficacy of an Internet-based behavioral intervention for adults with insomnia. Arch Gen Psychiatry 2009;66(7):692-8. Erratum in: Arch Gen Psychiatry 2010;67(3):311.
. The benzodiazepine withdrawal symptom questionnaire. J Affect Disord 1990;19(1):53-61.
. Insomnia as a predictor of depression: a meta-analytic evaluation of longitudinal epidemiological studies. J Affect Disord 2011;135(1–3):10-9. Epub 2011 Feb 5.
. Sleep problems, comorbid mental disorders, and role functioning in the National Comorbidity Survey Replication. Biol Psychiatry 2006;60(12):1364-71. Epub 2006 Sep 6.
. Risk of psychiatric disorders in patients with chronic insomnia and sedative-hypnotic prescription: a nationwide population-based follow-up study. J Clin Sleep Med 2015;11(5):543-51.
. Basic pharmacologic mechanisms involved in benzodiazepine tolerance and withdrawal. Curr Pharm Des 2002;8(1):5-21.
. Canadian Network for Mood and Anxiety Treatments (CANMAT) clinical guidelines for the management of major depressive disorder in adults. III. Pharmacotherapy. J Affect Disord 2009;117(Suppl 1):S26-43. Epub 2009 Aug 11.
. The German guidelines for the treatment of anxiety disorders. Eur Arch Psychiatry Clin Neurosci 2015;265(5):363-73.
. Evidence-based pharmacological treatment of anxiety disorders, post-traumatic stress disorder and obsessive-compulsive disorder: a revision of the 2005 guidelines from the British Association for Psychopharmacology. J Psychopharmacol 2014;28(5):403-39. Epub 2014 Apr 8. Canadian Medical Protective Association [website]. Risk management in elderly patients: medication issues. Ottawa, ON: Canadian Medical Protective Association; 2011. Available from: www.cmpa-acpm.ca/en/advice-publications/browse-articles/2011/risk-management-in-elderly-patients-medication-issues. Accessed 2018 Mar 22. Adverse events—physician-prescribed opioids. Ottawa, ON: Canadian Medical Protective Association; 2009. Available from: www.cmpa-acpm.ca/en/advice-publications/browse-articles/2009/adverse-events-physician-prescribed-opioids. Accessed 2018 Mar 27.
. Current medicolegal status of prescribing benzodiazepines: a special case. Natl Crim Justice Ref Serv 1995:41-52. Summary of the Updated American Geriatrics Society/British Geriatrics Society clinical practice guideline for prevention of falls in older persons. J Am Geriatr Soc 2011;59(1):148-57.
. Interventions for preventing falls in acute- and chronic-care hospitals: a systematic review and meta-analysis. J Am Geriatr Soc 2008;56(1):29-36. Epub 2007 Nov 20.